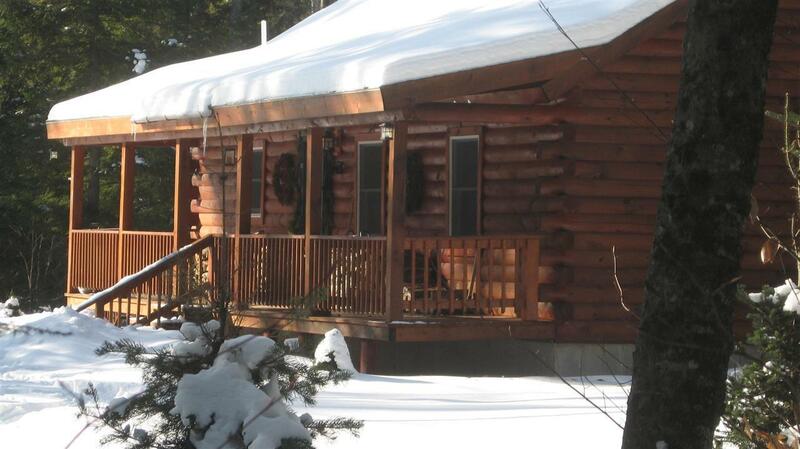 This lovely log home is located in a private, quiet setting along Quimby Brook....nature is your neighbor. Sit on your farmer&apos;s porch, watch and listen to the wildlife. Additionally, there is a deck off the dining area. Enter this home and walk into the open living, kitchen and dining areas. The living room has an efficient soapstone woodstove. The current owner primarily heats with wood, but the home as a a furnace that is only 3 years young. The large kitchen welcomes gatherings with family and friends. There is a bedroom on the first floor and another on the 2nd level. Full basement provides lots of storage. Beautifully landscaped. Close to all the White Mountains have to offer. Viqua water treatment system installed 2017, low annual maintenance.